For an overview of patterns of global military spending, my go-to source is the Stockholm International Peace Research Institute. 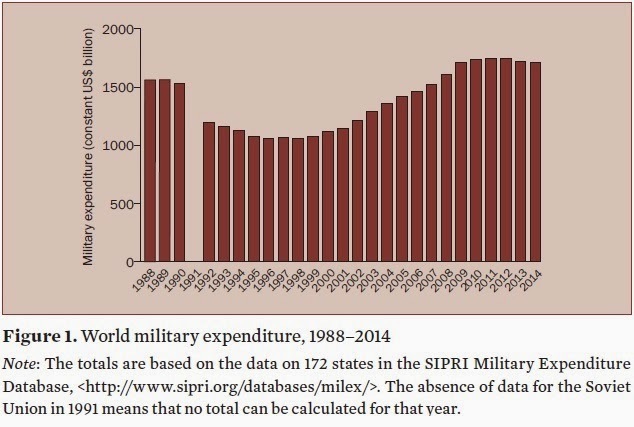 SIPRI has just published "Trends in World Military Expenditure, 2014," by Sam Perlo-Freeman, Aude Fleurant, Pieter D. Wezeman and Siemon T. Wezeman. Here are some patterns that jumped out at me. As a starter, here's the overall pattern of global military spending since the late 1980s. Since the Great Recession hit, global military spending has dropped a bit (as measured in inflation-adjusted dollars). 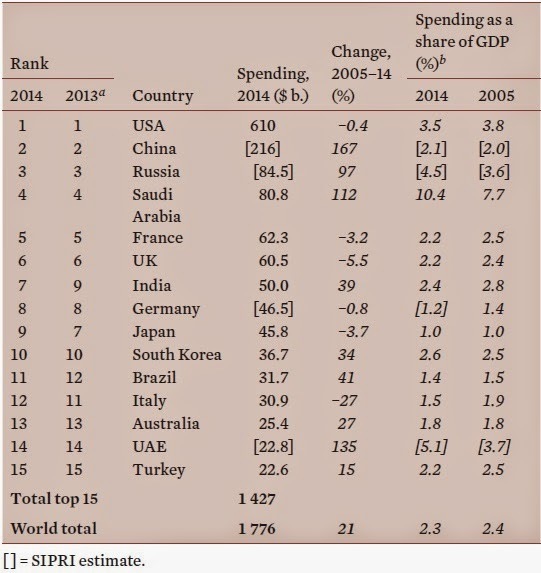 Here's a table showing the 15 countries with the highest level of military spending. US is one-third of all global military spending, or to put it another way, US military spending is roughly equal to the next seven nations on the list combined. Of course, it's worth remembering that military spending doesn't buy the same outcomes in all countries; for example, the pay of a soldier in India or China is considerably lower than that in the United States. It's also interesting to me that US military spending as a share of GDP is higher than for most of the other countries in the top 15, with the exception of Russia, Saudi Arabia, and UAE. And it's thought-provoking to compare, say, military spending in China to that in Japan and South Korea, or military spending in Russia to that in Germany and France. Finally, here's a list of the countries where military spending is more than 4% of their GDP. 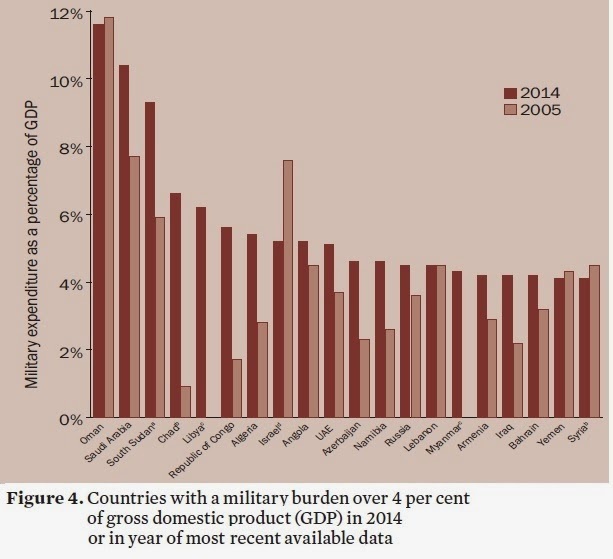 As the report notes: "A total of 20 countries—concentrated in Africa, Eastern Europe and the Middle East—spent more than 4 per cent of their GDP on the military in 2014, compared to 15 in 2013. Only 3 of the 20 countries are functioning democracies, and the majority were involved in armed conflict in 2013–14 or had a recent history of armed conflict." I won't editorialize here, except to note that when countries devote very high levels of GDP to military spending, they are putting their money behind a belief that using or threatening military force is in their near future. Manufacturing Up, Pollution Down: How? What about the EU Single Market? Is the World Bank Becoming Obsolete? 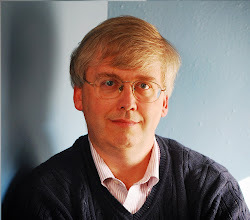 Better to be a Cynic or a Sentimentalist?